Engelberg is 36 kilometers away from Luzern. The ride would normally take around half an hour, but this time it took us a bit more. We were not the only one with the idea of going skiing. Engelberg was super busy when we got there. No big surprise there. 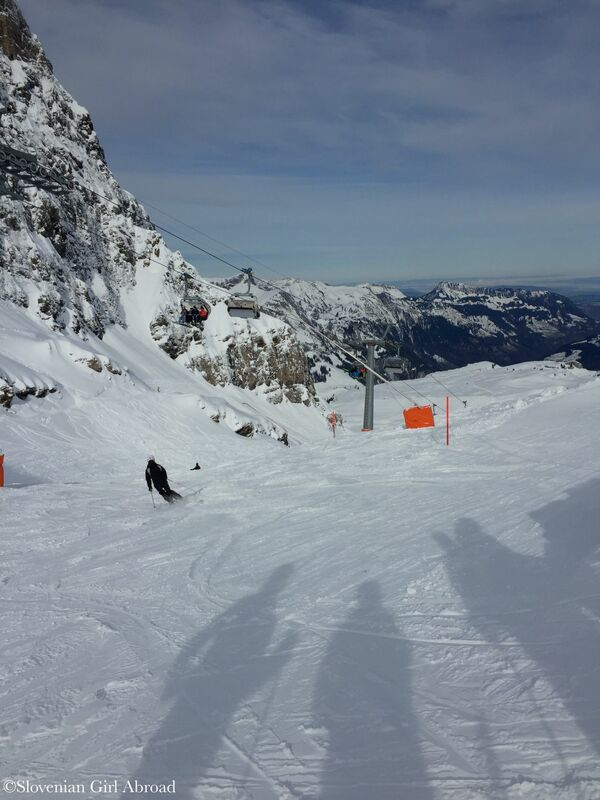 After all, Engelberg is the leading mountain resort in Central Switzerland and February is the time of school holidays. Also, this is the best time to find the best snow what makes February one of the busiest month in the Alps. After app. 20 minutes of slow bumper-to-bumper ride we’ve finally manage to get to the parking lot where we parked our car, put our ski gear on and walked to the to Titlis-Jochpass cable car station. There, we spent another half an hour queuing to buy our ski pass. 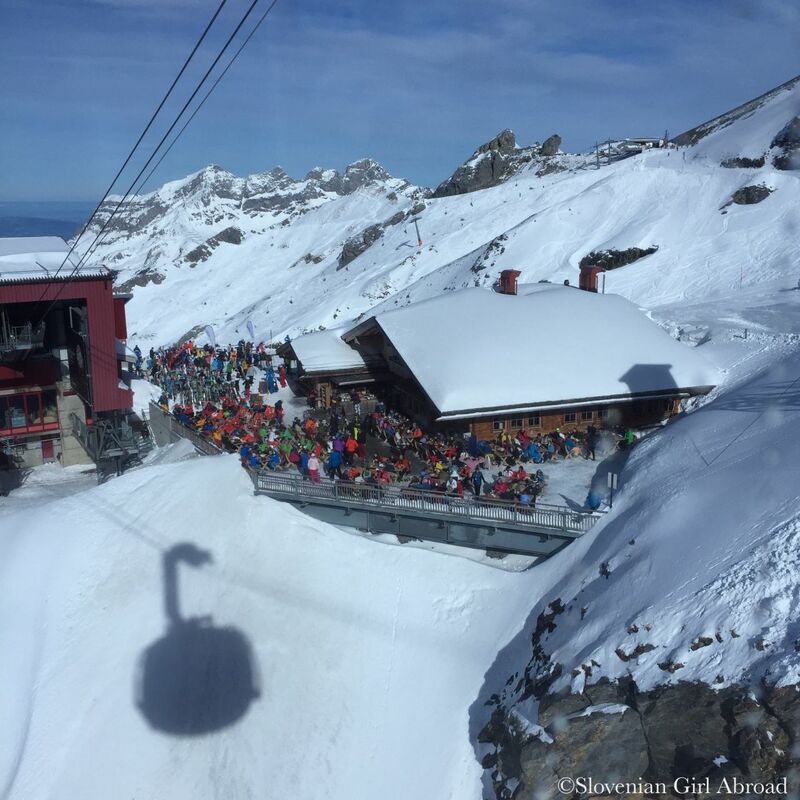 When we finally manage to get them, we had to queue again to get in the cable car that took us up to the ski area. 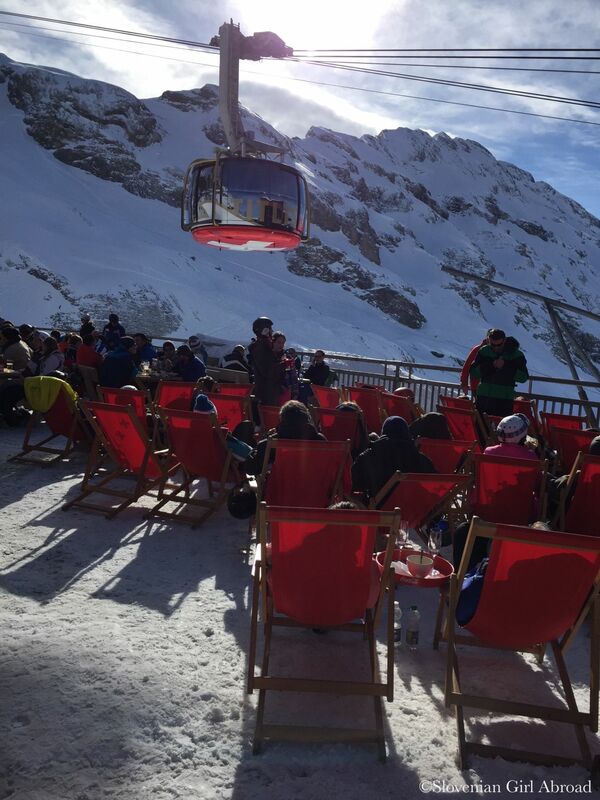 Although we’ve expected Engelberg to be busier than usual, we didn’t expect to be so busy. Once we manage to get to the ski area, we were a bit surprised the slopes were not overcrowded. Sure, there were a lot of skiers, but not as much as one would expect from the queues in the valley. I guess, the 82 kilometres of pistes stretching between 1050 and 3020 meters above sea level are large enough for crowds of skiers to spread around. Also well-run facilities coped with the masses very well. Once on skis, we’ve skied from the Jochpass area to the valley. From there we went back up, all the way to the highest part of ski area – Mt. Titlis at 3020 meters above sea level. Slopes there lies on the Titlis Glacier and can be skied long before/after other slopes in Engelberg opens/closes. Titlis is not only Engelberg’s highest lying ski area, but is also a popular destination for day trips to the Swiss mountains. 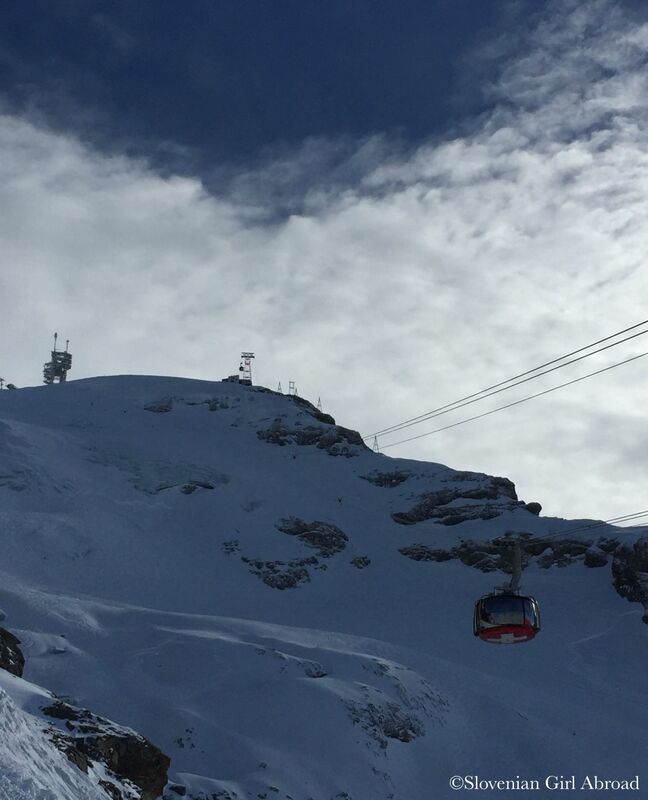 To get to there, you need to take the world’s first rotating gondola named Titlis Rotair. In five minute-ride to the top, it revolves 360 degrees and allows you to admire the panoramic views to the mountains from every angle. There are plenty of things to do and see at Titlis apart from skiing and admiring stunning panoramic views. For example, you can visit glacier cave and the Europe’s highest suspension bridge called the Titlis Cliff Walk. A meter wide and 100 meters long bridge is relatively new attraction, we haven’t seen on our previous trip to Titlis few years ago. Of course, we had to check it. Walking this bridge was interesting experience that got us even better sense how majestic are the Swiss Alps. 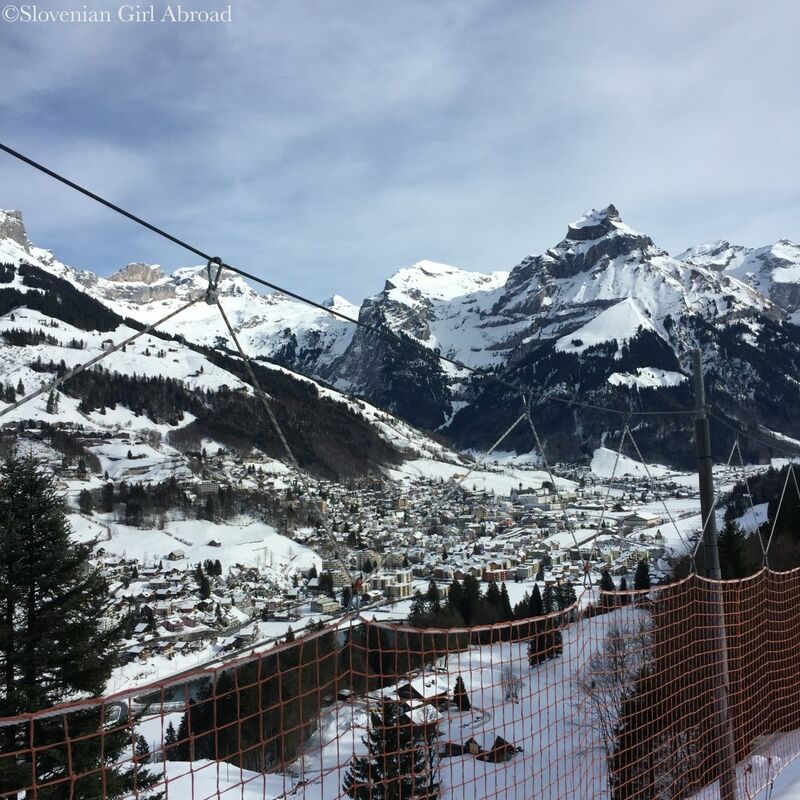 After we skied the glacial slopes at Titlis and walked the Cliff Walk, we thought of skiing down to Stand at the lower ski area. After we saw the warnings Rotegg piste that connects Titlis and Stand is rather demanding and is suitable only for excellent skiers, we decided against it. Our legs were already tired and we thought it would be safer to just take the cable car back down to Stand. We did just that and took a short break at Stand. Then we continued skiing down to Engelberg via Trübsee. Although all the Titlis-Jochpass ski area is lift-linked, it is broken to small areas (i.e. Jochpass, Stand, Titlis) spread all over the mountains, rather than being a fully interwoven network of slopes. I found this a bit frustrating, as it took us a while to get from one part of the ski area to the other. The ski terrain of Titlis-Jochsee ski area is mostly suitable for advance skiers, but there are also few slopes suitable for beginners. I’ve also noticed many skiers skiing off piste. Many of the off-piste areas are easy accessible from the lift-served ski areas. Apparently, Engelberg has became off-piste mecca in recent years. The weather was great, but the snow conditions not so much. It snowed few days ago and at the upper part of the ski area was the ski surface very soft. It didn’t take long before the snow got piled at the certain places and packed down at others. Skiing on such surface wasn’t exactly my cup of tea. Despite that, I had a great time. I highly enjoyed a day out on the snow in the mountains. I’m linking this post up to #MondayEscapes with Packing My Suitcase and My Travel Monkey. Oh wow, a real ski paradise! It looks amazing and must’ve been real fun! Brings back fond memories. I skied in Engelberg 15 years ago! Awesome! 🙂 Looking at my photos, do you think ski area changed a lot in all those years? Titlis Jochpass ski area has hardly changed. The Titlis Glacier is still very much vivid in my memory. Would love to return some day! Wow. I’m jealous — what a beautiful place! Great photos, Urska! 🙂 Looks amazing, makes me realise what a LARGE world we live in if I haven’t been to this kind of place. 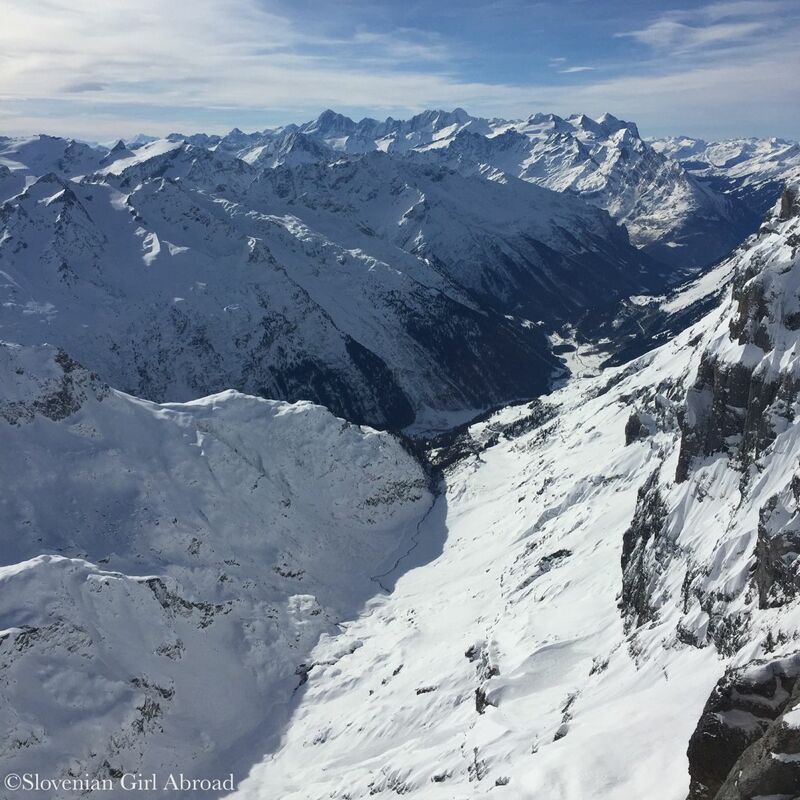 I can’t ski – but is a trip to the Swiss slopes still advisable or not? I’m not a skiing fan but the views up there are amazing! It’s been years since I’ve been to Switzerland, but it’s one of the countries I like the most!